Wonder Woman #51 Review - Impactful! 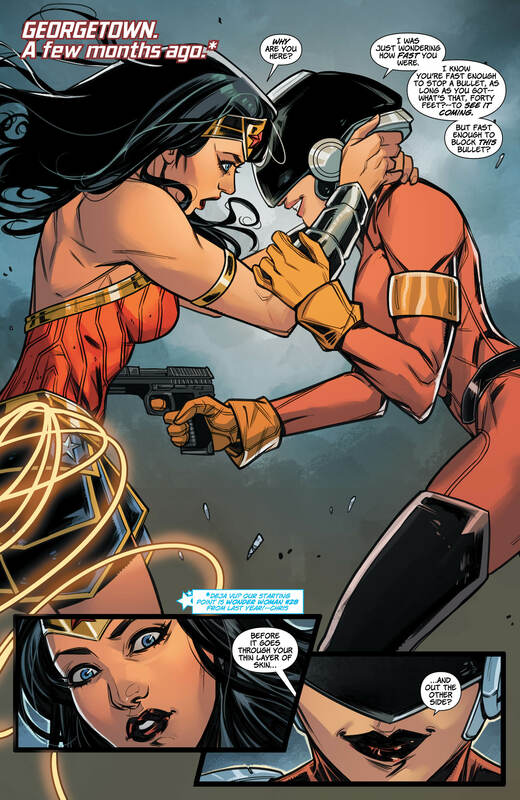 Wonder Woman #51 Review – Impactful! Verdict: 4.25 / 5Whilst huge cosmic battles certainly garner ratings and big moments, it is these smaller slower chapters that add significant depth to the characters that inhabit this DC universe. Wonder Woman #51 is a fantastic standalone tale that transcends the many adventures that Diana has gone on and, instead, slowly tracks a hidden friendship over a long period of time. Claimed by the titular hero to be one of the few constants in her life, the consistent visits to prison to see her former enemy, Mayfly, is a story worth telling. Picking up from Wonder Woman #28, this narrative has cleverly continued amongst the many other issues that have come after. 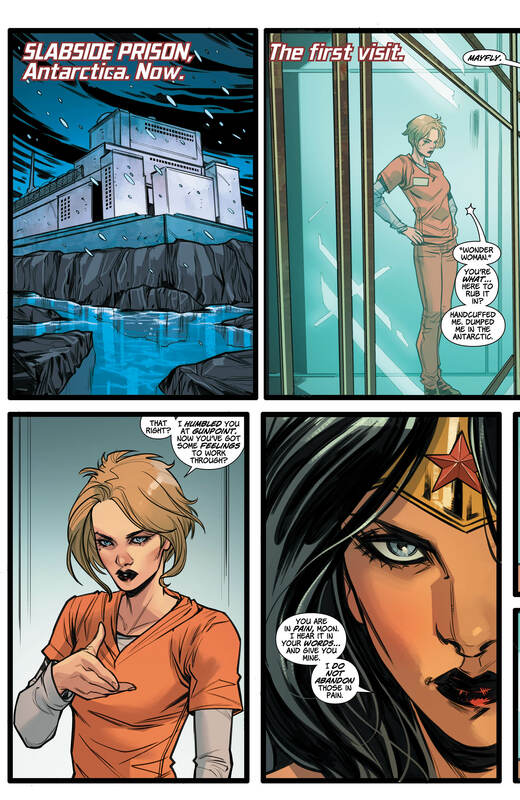 With Wonder Woman’s and Mayfly’s battle ending with the latter imprisoned in a supermax in Antarctica, the Amazonian warrior feels it is her duty to continue to support this fallen villain, helping her to find peace in a world that has judged her from birth. Miss Moon here has been written with a strength complex that is fuelled by her haemophilia. The weakness that has been assumed of her, due to her health condition, has caused many mental battles for the young antagonist. Obsessed with showing her strength, especially against the likes of a goddess, Moon feels that the only way she can live her true life is by ignoring the assumptions that held her back and proving herself amongst the criminal world. For Moon, the amazing Amazon is completely un-relatable in every way. A goddess has been born with power and will forever have the strength that many mere mortals will never experience. It is with this issue however, that a bond is formed over time between these two rivals, with each learning to understand the other. This tale needed to be told in this format, because a healing like this cannot happen in one instant and requires trust and a long-term commitment to betterment. The humour and heartfelt moments in this issue felt earned from the get go and added another detailed layer of consistency and compassion from Diana. The battle amongst these two has been fought for years with words rather than weapons. This is a much more compelling way to tell this story. The adversary that the two characters have faced, whilst unique in their own rights, have a lot of crossovers that were carefully laid out. Taking villains like Mayfly and Inversion and writing them into this small arc is a really interesting technique for me. I love it when obscure characters are brought back because every now and then there is a breakthrough personality that people become attached to. I truly believe that Mayfly may be one of those characters, with many eager to see where her story takes her next. This has been written as a redemptive arc, but that does not mean to say that her life on the outside will be quite as morally straight. The struggles are perhaps just starting for these unlikely friends, who have earned each other’s respect over time. The art in this book was fantastic and truly caught the emotions this tale needed. The story was succinct and impactful, without ever overstaying its welcome. Issues like these are what make up the heart of a character.